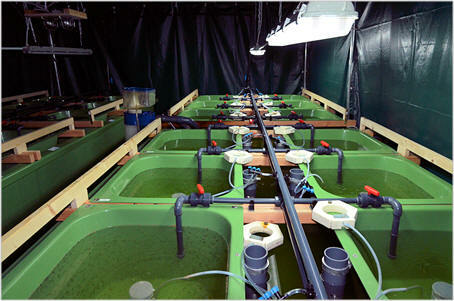 Sustainable growth of the aquaculture industry requires fry in a reliable quality and quantity. Despite considerable progress in aquaculture in the past 20 years, high mortalities during larval production and variable fry quality is still considered as a bottleneck for aquaculture production and is a major reason, that a number of marine species cannot yet be produced in an economically viable manner. 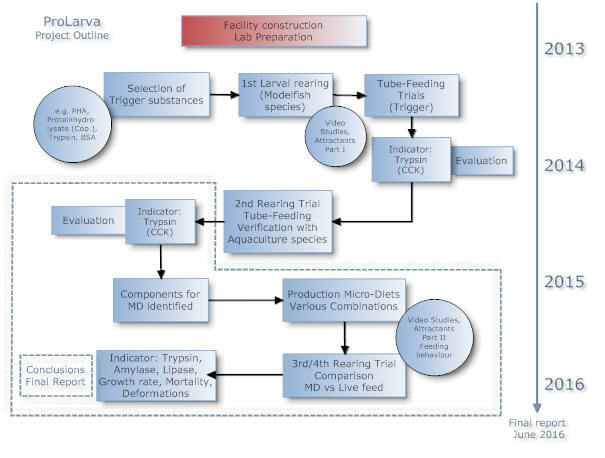 The digestive physiology of larval stages has relevance to mariculture since many problems of survival and quality in fry production are apparently related to the performance of the digestive physiology during ontogeny. The quality of first feed which has to meet exactly the physiological and digestive capacities of the early larval stages is the major issue in the optimization process improving survival rates. The "Larval Module"; the picture shows part of the rearing tanks designed and dedicated specifically to conduct rearing trials with fish larvae The facility was built into a large industrial tent, which allows to adjsut any kind of day and night rhythm and protect the facility from any unfavourable introduction from other activities in the environment. The project "ProLarva" aims to improve the nutritional quality of first feed under consideration of micro diets with the goal eventually to facilitate the replacement the traditional live diets as first feed. Specifically the project focuses on the investigation of the larval digestive physiology and aims at discovering ontogenetic and nutritional deficiencies in the first feeding phase, where usually the highest larval mortality occurs and will identify diurnal rhythm in digestive enzyme capacity in order to provide recommendations for feeding regimes which consider the ontogenetic capacities in digestion efficiency. The results will be used in a second step, to identify feed components which may improve the digestion process in early larval stages and may help to overcome the identified deficiencies. Finally, substances which are identified as useful will be encapsulated into micro-diets and applied to the larvae, with the potential to balance natural deficiencies and ultimately help to reduce early stage mortality significantly. Microdiets which are readily available at any time with a constant quality and optimized composition would be a major advantage over live feed. Rotifers and Artemia are live animals and therefore quite variable – from its nutritional value and where it is harvested, to how it is enriched and packaged. Artemia can also harbour bacteria and it has been found that feeding live prey to larvae can cause problems such as enteritis, stress, and create an imbalance in the rearing environment, which in turn can significantly reduce survival rates. Moreover, concerning brine shrimp the resource is limited. Looking at Artemia harvest data from the last 25 years, one learns that during years with favorable conditions the natural production peaks around 3,000 ton per year. All of these harvested cysts are consumed every year by the current aquaculture industry. On the other hand, according to the forecasts of FAO, World Bank and other entities, the yield from seafood production is expected to double during the next 15 to 20 years. It is obvious that such growth can only be realized when more fry can be produced with less Artemia.